Hydroponics , or the method of growing plants in a water-based environment, rather than a soil one, is not a new concept. For years, hydroponics have been used to grow, well, plants that aren’t exactly legal to grow unless you live in Amsterdam or some place like that. However, in the past couple of decades many produce farmers have swapped to using water-based systems for their growing. 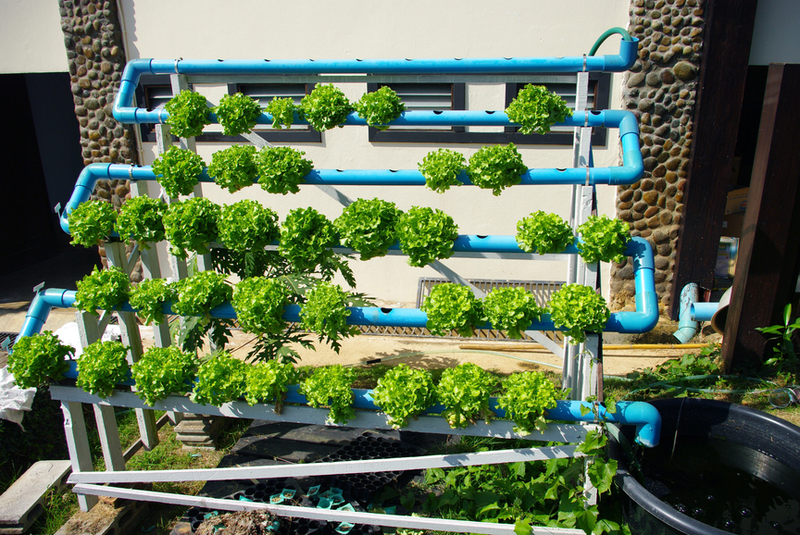 Even more recently, hydroponics has provided many people with a route to quickly and efficiently grow their own food. In this article we’ll cover the benefits of hydroponics, as well as a run through on how an actual setup works. Benefits: A hydroponic system has many benefits for both home growers and for professional farmers. In certain areas of the world where growing seasons are short, hydroponics provides a way for food production to go uninterrupted year round. This has been a huge boon to the agricultural industries of certain nations, and has helped lessen their need to important food. Another benefit of a hydroponic growing system is that plants receive nutrients in a more efficient way and will grow larger and in a shorter amount of time. Tomatoes for example, reach full size after about 12 weeks of growing in soil. Growing in a water-based environment, this is reduced to just 8 weeks. Quality is not altered by this method of growth either, but there is an ongoing debate over whether soil grown or water grown plants taste better. Personally, I can’t taste a consistent difference, and the nutrients used in growing probably have a much bigger impact on taste than hydroponic vs. traditional growing methods do. Better still is that most hydroponics systems actually use less water than traditional growing methods because the water is able to be recycled. One of the main benefits of not using soil is that you can’t have soil-based parasites and insects infecting your plants. Additionally, this eliminates the need for any pesticides, making hydroponics less work and (arguably) safer. A basic hydroponic setup will have three elements, the first of which being the actual water/nutrient system. There are a wide range of systems but it usually follows the rules of thumb that a more efficient system is more difficult for a beginner to monitor. More expensive systems offer the benefit of faster and more perfected growth rates, and many are automated so you don’t have to do much after setup. On the other hand, they are more fragile, and everything must be set in motion perfectly for success (this is why, despite them seeming more “hands off,” these systems are more difficult for a beginner. – The lamp, or actual light source, can actually produce different types of light that are specific to different growth stages of the plant. While it may not be ideal, you can also get a dual spectrum grow light, which will not be as specific to the growth stages of the plant, but is cheaper. – The reflector is the covering that protects the grow light and directs it. This is basically just the metal cover you see above most fluorescent lights and it keeps most of the light shining on the plants, rather than up into the ceiling. – The third part of the lamp is the ballast, which basically boils down to the electrical components of your light. A digital one will have a dimmer and some fine-tuning controls, so consider this when purchasing a grow light. Lastly, your whole system needs air. Not just passive air, either. A hydroponics system will usually include a fan that can help circulate air evenly. In a standard growing environment, most plants get as much as 75% of their life essentials from the air, and only 25% from the ground. For this reason it is good to place more emphasis on a good air circulation system than you might think you need to. Additionally, you can use a grow tent to fine tune and isolate your setup, but when you’re just starting out this is probably not necessary and you can make due without one just fine. The main thing you’re going to need for your system is space, and this obviously varies with how much you want to grow and what type of setup you’re going with. Many people have their hydroponics setup in their garage, a greenhouse, or a spare room. If you’re just experimenting with a few plants, then a spare shelf or table will probably work just as well!